Since The Mister (aka the guy I married), is a Brent Weeks fan, I let him read my review copy of The Black Prism before I did. [The Mister: My wife is supremely awesome for letting me drench myself in Weeks’ fantasy before her]. Although The Mister didn’t want to write a review, he did agree to do a book chat with me. This is my last Brent Weeks post for a while, I swear. OK, so first question: So if you were to describe this book to someone else who you were pimping the book to, what would you say about it? So what, you want me to give some flashy summary blurbs? uhm.. The Black Prism follows the life of Kip, a kid from a rural town who suddenly finds himself thrown in to a world of magic, war, and general mayhem. Luckily for us, the stereotype doesn’t much hold up as you dig in to the details. To be honest I’m not sure if Kip is intended to be the protagonist, and I suspect that’s intentional – from the start, the character building is a bit twisted in an enjoyable way. There are some details of the immediate gratification type, but also some longer term building, with all of the *-agonist characters. As an aside, I expect there will be some negative criticism of how some of the characters have been designed (particularly Kip), but those critics are short-sighted. On the larger scale, The Black Prism is the story of a kingdom still recovering from a civil war now 16 years past, with divisive rulers of uncertain power…basically, poised to drop right back in to war. The construction of the world has some obvious heritage, but also enough unique touches to avoid the feeling of been-there-done-that. It has a good balance of being fantastic enough that you can escape in to it (color magic, low/medium-tech culture, moderately detailed side info on geography, politics, etc), but not so out there that a reasonable imagination can’t find a way to connect their world with ours (“humans” are the only sentient race, swords + armor + guns, …). I agree, there are multiple points of view but it was done well, with probably Kip and the Prism, Galvin Guile as the two most important protagonists. I also liked that Kip was this overweight kid who felt very uncomfortable in his skin and always mentally berates himself for things that come out of his mouth. I also agree that while this world has some familiar fantasy elements, Weeks makes it his own. I particularly loved the magic aspect of the world building. Comparing this to The Night Angel Trilogy, I notice a couple of themes – teen boy with a mentor, unvoiced love, and secrets! Do you agree? Actually, I hadn’t yet thought of The Black Prism in comparison to the Night Angel crew. The themes are generally there but the distinctions may be more interesting. Kip and Azoth each end up with very powerful mentors, both arguably of similar convictions at one point or another; but whereas Azoth showed hints of strength from the beginning, and sought out Durzo, Kip fumbled “fatty-style” all over the place until he happened to fall in to Gavin’s lap. There are more similarities, I think, in the unvoiced love and secrets categories. Both Azoth and Kip have big hearts from the start, which of course makes them likable even when they’re killing (in Azoth/Kylar’s case) or doing bad/stupid things. Their love isn’t limited to romance though; Azoth’s first kill is driven at least initially by his love for Jarl, and Kip’s first acts of bravery are to save others (admittedly along with himself), and they occur before Liv is anywhere near the picture. From there though, as with the mentorships again I think the examples diverge. Both have loves that are initially unvoiced, but in Azoth’s case, it was easy to understand Doll Girl’s initial adoration, and eventual love for him. In Kip’s case, it’s easier to imagine that his love will be revealed but unrequited. Not because of physical appearance necessarily, though that may be considered, but because I get a sense that Kip is simply much more fragile than Azoth. He’s being forced to grow up ridiculously fast, and he’s learning a lot about his strengths, but he’s not yet having to face his weaknesses on a grand scale (no pun intended, and Thresher notwithstanding). I’d think that would be a great detriment for him having any sort of relationship with Liv – his continued weaknesses may serve to keep him as a pre-teen in her mind. I was thinking about Gavin in the unvoiced secrets/feelings arena too. Yeah, hmm, Kip is in many ways more vulnerable than Azoth was – he shows the world a glib face but his inner self confidence is not there yet, and Liv sees him as a kid, but then she’s older than him, (he’s 15, she’s what, 17?) so of course she would. Anyway. New topic. When I read Weeks books, I sometimes worry about what will happen to the characters I like because there are often crazy twists. Do you feel like that too? And what do you think of some of the bombshells? Awesome? Evil? Awesomely evil? I do worry about the characters I like, because the twists often alter your view of the characters themselves. It seems one of Weeks’ favorite mechanisms is to F with your sense of who’s good and who’s bad; there’s just not much black/white stuff going on. Durzo certainly had a lot of redeeming qualities. Before we’re made aware of the whole Gavin is Dazen is Gavin thing, it’s hard not to like Gavin, even given the assumption of his transgressions (one of which of course turns out to be the real Gavin’s). With Kip, it’s sometimes unclear whether his quirks are meant to provoke laughter, or pity, or what…I suppose it depends on the reader…but whatever the reaction, it serves to lessen ones view of him in a purely “hero” sense. Not that that’s a bad thing! Interestingly, Weeks seems to design his women more straightforward than the men.. The bombshells are 100% evil, 100% awesome. That’s right, 200% awesome/evil bombshell goodness, baby. I think that because Kip and Gavin are the two main protagonists we see a bit more nuances to their characters than we see in the women. Liv and Karris are slightly more secondary but they get their spotlight too and we begin to get hints about their internal struggles. I’m particularly interested in what happens to Liv in the second book. In the video Brent Weeks made at Comic Con for this blog, he said that book 2 was looking so long that he may break it up into two books. What do you think of this? The setup for the sequel(s?) is obvious, and I do hope it ends up being at least a trilogy as originally advertised – if the alternative is to cut down the story to fit in a second book that cleans everything up, I’ll be pretty disappointed. I happened to think The Black Prism was a good length, too – despite its 600+ pages. By page 200 or so I was lost, and I don’t remember counting pages at all through to the end. It’s also easy for me to imagine (and hope for) prequels, detailing the False Prisms War, the personal/political stuff between Dazen and Gavin, Karis’ relationships, General Danavis + Dazen, etc. Then pre-prequels, going back to Papa Guile’s younger days.. Overall what did you think? I think I may like this first book better than Night Angel’s first. I’m dying the read the second one. Compared to the first Night Angel book, I feel similarly anxious for the next, but I feel more “in the know”. After The Way of Shadows, I remember having almost too many unanswered questions. It made me want to read Shadow’s Edge immediately (and I did), but it was a lot to process…or maybe I’m remembering wrong. In any case, I think the end of The Black Prism gives an excellent balance of satisfaction versus what’s-next, so overall I liked it better than The Way of Shadows. The Premise: Kip is a fifteen year old, overweight son of a drug addict mother and an unknown father. He lives in Rekton, a small village in Tyrea, a satrapy which has suffered in the sixteen years after the Prisms’ War because it sided with the losing brother, Dazen Guile. Now the victor, Gavin Guile, is Prism and figurehead of the seven satrapies, but the Prisms’ War has left a lasting impression. There are those in Tyrea who are displeased with the current state of affairs. They have their own agendas, which start to become known when they set to wipe out every man, woman, and child in Kip’s village. In the meantime, the Prism, Gavin Guile, is 5 years away from the end of his rule and 5 goals he has set for himself. He is the only man in the satrapies with the ability to bend light in all seven colors of the spectrum, but his power is not that of a ruler, it is more that of a figurehead. When Rekton is targeted, he has a unique perspective on what the ramifications are, on both the Chromeria and on the secrets he’s been hiding from everyone for over sixteen years. My Thoughts: I don’t think the premise really covers everything that is going on in this story, but it will have to do because there is a lot going on in this book. Where do I even begin? Let’s start with the characters. The book is told in the third person with multiple points of view. The focus mostly shifts between Kip and Gavin Guile, but it sometimes moves to others, like Karris, Gavin’s one time fiance, now a warrior elite, and Liv, Kip’s childhood crush. There is also one more character we hear from – a mysterious prisoner. We begin in Kip’s village as Kip learns that the army of the Tyrean satrap is moving in to make an example of his village. The horror of the killing seen through Kip’s eyes as well as his confused escape feels like classic Brent Weeks stuff. In Night Angel, I found the life of children in the slums very dark (it’s probably the darkest part of the book), and similarly in The Black Prism, war is hard on it’s victims, and as a reader, you feel very protective of those that have escaped those horrors. 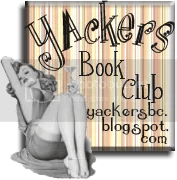 Kip is a boy who thinks of himself as a “fatty” and is painfully aware of his own awkwardness, but that is balanced with a strong sense of loyalty and a stubbornness that endears him to the reader. In contrast, Gavin Guile seems like the opposite of Kip – powerful, accomplished, handsome and smart, he exudes a confidence which is matched by what he actually can do – he’s probably the most powerful Prism the world has seen. Of course when we read more about him, we find that he has his own problems. In some ways he’s been an outsider like Kip, and although he’s ruthless, he’s been using his power in the hope of doing something for the Greater Good. It was interesting to compare Gavin’s revelations about his past with Kip’s current growing pains. He’s very likable despite what we find out about some of the things he’s done as the book progresses. I found myself seeing a person who is at fault for some horrible things, but not a bad person. His past decisions haunt him. It was fascinating to find out more and more about his past and what his secrets are, and I don’t think we uncover it all by the end of The Black Prism. The female characters in this book have less face time compared to their male counterparts but I did enjoy what I read. There were certain passages while the focus was on them that I think Weeks must have asked for female input because I think he got it spot on. I am also happy when there are characters who are mixed or minorities. We see many of those in this book, and Liv has a unique point of view as a Tyrean in a world where her skin color marks her as such and they’re not treated well by the rest of the satrapies. It does affect her experience and how she sees other people’s actions. There was an excellent balance between the individual character development and the overall plot line which has a much broader scope. It’s through the individual struggles at we piece together an idea of the overall picture – the complex politics, relationships, and past of the world is made human and relatable. For example – as a reader who does not have much interest in battle scenes in books, I was much more engaged in The Black Prisms battles than I usually am. That’s because I felt much closer to the action. The jumping from Kip’s viewpoint, to Gavin’s, and Liv’s and Karris’, I only see a small sliver of the general chaos but I can piece together what is going on and I’m invested in the survival of Kip, Gavin, Liv, and Karris. This is a technique used throughout the book with a lot of success. Weeks also has a way of putting a lot of twists and turns into each of his stories. If you’ve read Weeks before, you will be familiar with it, but this is a heads up for those who haven’t. At this point, I do find myself expecting the unexpected and I’m beginning to enjoy trying to guess where the next surprise will be, although Weeks still manages to throw in several things that I never saw coming (and I would say are impossible to see coming). In his video interviews, Weeks says that he plans the twists and turns. That has to be the only way to have so many revelations that may have had minor forewarning, but readers won’t realize the clues till later. I’d say that overall I haven’t had a nasty surprise in the revelations or plot twists (Well. One in the beginning tore me up a bit, I recovered), although I do admit worrying about my favorite characters and what could happen to them. I liked the characters and their development, but my favorite part of this story was the world building. If you follow my reviews, world building is one of those things where if it’s unique and done well, it makes a big impact on whether I ended up liking the book. The familiar fantasy world in the Night Angel books was probably my biggest complaint about them, but I have no such complaint for the Lightbringer series. I loved the level of detail that went into the magic in this book. The concept here is that magic users in this world can transfer light into physical form, and to do so they have to absorb the particular color that they “draft” through their eyes – so light affects magic as does eyesight. Drafters of different colors can do different things and there is a physical toll to using magic that is not only exhaustion. Using magic essentially shortens the lifespan of a drafter. That the world’s government and religion is linked to the seven colors and to the one person a generation who can draft all seven colors (the Prism), just makes things better. Overall: If you are a fan of epic fantasy, this is an excellent series to try. I found the characters likeable, the world building unique and better than Weeks’ last series, and the twists and turns addictive. I’m not really sure I can come up with any negatives here, and I’m also having a hard time not going into some of the great parts of this book because they would be spoilers. Just know that this story is over 600 pages and it is jam packed with epic goodness. I’m really looking forward to the second book. Something special for today – a video where Brent Weeks, author of the Night Angel trilogy and a new series, Lightbringer, answers a few questions I sent to him via the folks at Orbit at Comic-con! I’m about two thirds done with his newest book, The Black Prism (which comes out August 25th), and it is so far really good. My husband has already read it and has been asking me where I am every night. I’ll be posting a review next week plus a book chat with The Mister about it. Pixelated Geek has a 15 minute interview up at their site. For some fun stuff go to Brent Weeks’ website and take the What Color Is Your Magic Quiz. I’m apparently a superchromat and Blue Drafter. This book languished on my nightstand for a few months. My husband bought this series after realizing it’s about assassins and he recommended it to me after he finished. The 645 page length was daunting though so I didn’t get around to reading it until I was threatened, err, reminded that my husband wanted to lend it to a friend and I better read it before he gave it to them. The Premise: The first book in the Night Angel trilogy, this is an epic tale about the citizens of Cenaria, but the focus is on Azoth, a street urchin who lives on the streets with a ragtag band of other children. His group all hand in most of their earnings to Rat, one of the “Bigs” of their group, who leads through terror. Azoth rashly provokes Rat who decides to use him as an example and Azoth’s only hope for survival (and protect his two friends, Jarl and Doll Girl) is to apprentice under Durzo Blint, the best wetboy (an assassin with a magical edge) in the city. Durzo is never afraid and Azoth wants to never be afraid again. That’s how the book begins, but it becomes bigger and more complex as we meet new characters and see the intricate interactions between them their ramifications on the fate of Cenaria. My Thoughts: How do I describe this book? It starts off sort of simple and then becomes more complex as you go along. At first when I got a sense of the city, I wasn’t that impressed by the world building. II felt like it wasn’t something I hadn’t seen before: the groups of street children, the idea of Guilds, the corrupt king and unrest while a neighboring land populated by evil magic-doers plots to invade. It reminds me of a lot of other fantasy, but that was okay, because after the world building foundation was in place, the characters and the plot were so unique fascinating my earlier quibbles were forgotten and I enjoyed the book. The author also introduces some new-to-me magical aspects which are peppered throughout the story. The Way of Shadows begins as a coming of age tale. Azoth has nothing to protect himself or his two friends, the young, mute Doll Girl and the smart but small framed Jarl, and he dreams desperately of leaving the streets and apprenticing under the number one wetboy in the city, Durzo Blint. Azoth’s dream is an almost impossible one, but he does manage to catch Blint’s attention and Durzo promises to teach him only if he passes a test. I was really engrossed by this part of the story – wanting Azoth to pass his test and to destroy Rat, but it is also probably one of the most violent parts of the book. The abuse against children, by other children, while adults may know what’s going on and do nothing, was really hard to read. It gave me chills, but it sets up the story so you know not to expect things to go the way you want them to. The second part is the apprentice-ship phase where Azoth becomes someone else–Kylar. He trains and grows up and so do his friends and enemies. The focus of the book shifts a little and we get introduced to the points of view of some other characters. Brents starts setting the characters up like pieces on a chessboard. Friendships and actions that occur in this phase may be small and seemingly insignificant but have greater repercussions later on. We also get a lot of interesting characters and begin to learn about their motivations and secret griefs. I particularly liked Durzo Blint who avoids morality and emotional connection. Finding out why and whether it really works for him is part of the fun. Azoth/Kylar’s training as a wetboy was fascinating but not glamorized. The book doesn’t shy away from the darkness of the job. The final part of the book is Azoth’s final trial to become a full-fledged wetboy. The one thing you should keep in mind if you read this book is DO NOT expect things to go the way you think. At first the twists are minor, but the further you get into the story, the more you realize much of the book is set up for more and more surprises and turns. I think this author has an evil streak, because characters I had begun to like as suddenly killed off while characters I hated kept being despicable and unchecked. Each of the characters only knows his or her little part of the story and often acts without knowing that they’re doing the wrong thing for the overall picture. If you really connect to a character you may get disappointed at what happens to them, but ultimately I thought that the book did end in a hopeful place despite all the things that go wrong. Of course, this book is LONG. I was 200 pages from the end and wondering how we weren’t already at the end, because the sh*t was hitting the fan and I couldn’t see how there were 200 pages to go. 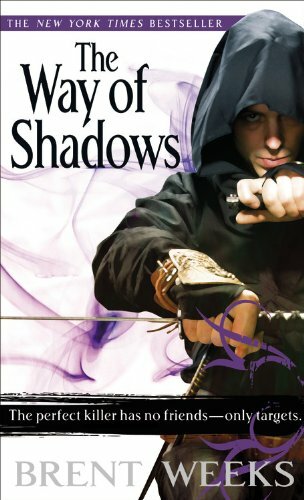 Usually in fantasy the ending happens shortly after a battle, but in The Way of Shadows, the author was not done, things kept coming, more and more twists showed up, I couldn’t believe it. While I could appreciate the twists, if I can find any fault, I’d say they did start to feel improbable just by how often a new one was thrown in. Overall: An gritty epic fantasy tale with more twists than a bag of pretzels. It didn’t quite wring me out and I thought it was ultimately hopeful and worth the read, but it was a roller coaster. I’m very curious where things will go now.